The texture of these blushes is a mousse, spongy-like, cream to powder finish, similar to the Maybelline's Dream Bouncy Blushes. I didn't buy all of the shades available because I wanted to try to see if I would like it and if it will compliment my medium skin tone. The shade that I was drawn to was in Rose Gold, which I find it is lightly pigmented with a sheen of gold to it and it is very easy to blend. It also illuminates my cheekbones with a look of a healthy radiant glow. The only downside to it, since I have an oily skin, the product tends to fade after 3-4 hours of use. The only solution for it, if I layered it with a powder blush then the life span for the product to stay is longer. I like to apply the blush using my Real Techniques Contour Brush because it's small enough to just touch on the spot where I want it and it distributes the product evenly. 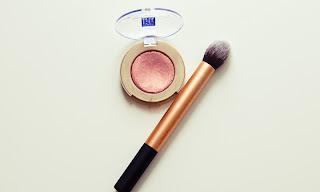 Overall: In my opinion, this blush is nice for an everyday use, especially if you're looking for a flush of colour with an illuminating effect. The price for an 0.14 oz is quite high for a drugstore, $12.99 cdn. I would re-purchase this product and try the other shades but maybe when it goes on sale.